After our fantastic Norway Cruise and a few more days with son Kerry and family we headed back to the South of France. We took the western route this time as we wanted to visit a Funster friend Frankie (MotorhomeFUN.co.uk) and take her out to dinner as a thank-you for helping us sell our beloved leVoyageur motorhome. 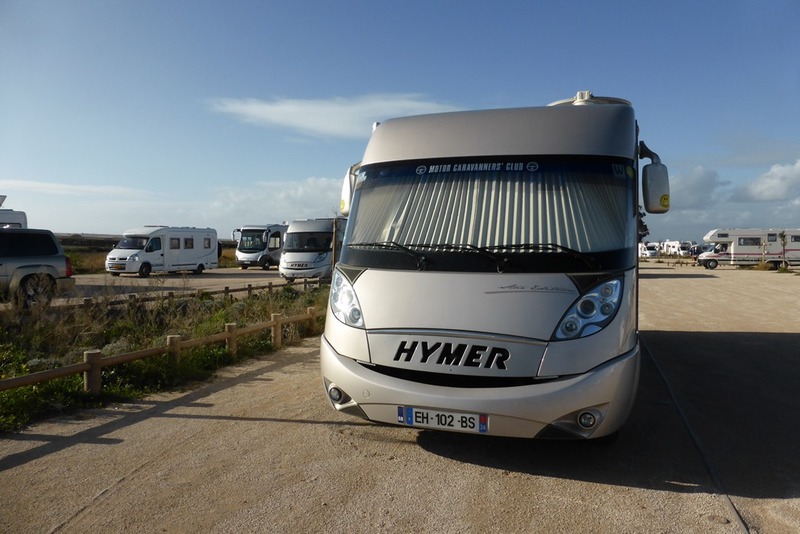 December at MaisonMinervois.eu was a few chores and jobs on ”Jemima the Hymer” our motorhome, catching up with friends and various Christmas meals and parties. We had decided this year that we would have a nice quiet Christmas on our own. We created our own turkey from a Turkey Leg boned and rolled with some flattened Turkey Breast and filled with stuffing. It was fantastic and just enough for Christmas dinner with enough left over for a few days of the most important part of Christmas, delicious Turkey Sandwiches. Boxing Day saw us packing the final bits into Jemima ready for the off next morning towards the winter sun, with drinks and “Turkey Sandwiches” at our neighbours Liz and Martin in the evening. At 9 am we were away, amazing for us to actually be ready on time, except that we had to stop on the way to get some cash from the bank. Steve was feeling good and amazingly with only a couple of stops he drove for thirteen hours 742 km, at 10pm we stopped at Xeraco just short of our destination of Javea to visit friends who had moved there from our local town in France. It was only in a road by some factories but very quiet and amazingly there was very good free public wifi there. In the morning we got an email from our friends saying that her dad was not well in the UK and it was not possible for us to meet up that day, a bit of a shame but a blessing as when we arrived at the site we had planned to stay at for a few days in Benidorm, there were only three pitches left only one of which was really suitable for Jemima because of their position. This particular site Armenello, doesn’t take bookings except from regular long stay customers so we couldn’t have booked ahead. Our friends Fred & Chris and Chris & Lyn had already arrived and we had five days which took in the New Year celebrations on the beach front which was fun with very good weather. Not quite good enough for shorts but nearly. We left Benidorm on the 3rd January 2018 and parted company with Fred & Co who were possibly going to stay in Spain. But we were headed for Portugal or Morocco, we would decide which way when we reached Granada. We decided on Portugal as we had only planned on being away for two months this time and we had liked the feel of Portugal last year and wanted to visit some other spots in the Algarve and spend more time at each. 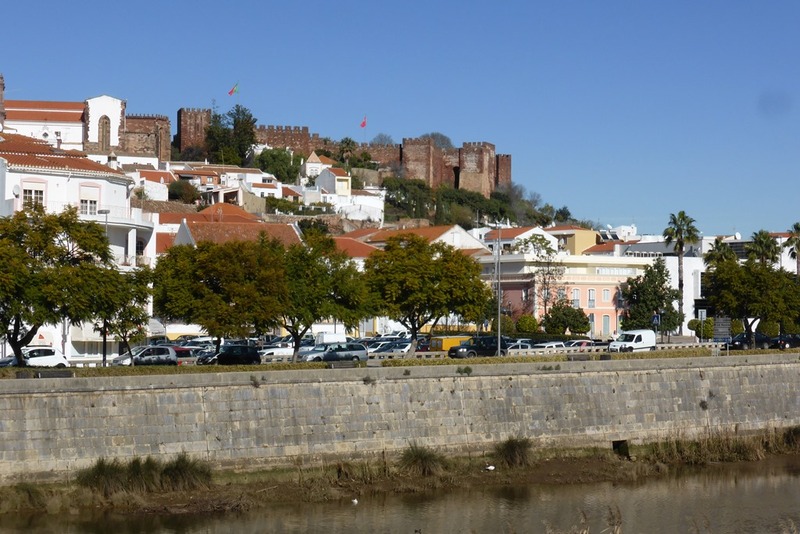 Villa Real de Santo Antonio which is the first town in Portugal literally just across the river from Spain. with a fairly basic Camper Stop (N37.19887, W7.41486) only €4.50 a night with water, waste disposal and wifi included and even electricity for an extra charge if needed. We had seen it last year but didn’t stop as after heavy rain there were massive puddles after heavy rain. We picked a spot where we thought it was dry last year and were proved correct after a night of continuous rain. Some people woke to find their Motorhome parked in a massive puddle but around us was dry. The town is nice with quite a few shops and a supermarket and even a little ferry across to Spain for a diversion if you wished. After three nights we filled up with water and moved on 76km to what we had heard was a tolerated parking area at an enormous carpark behind Faro airport (N37.01400, W7.98504). There were probably more than fifty motorhomes parked there. We found nice walks across to a peninsular where the beach was and another along a boardwalk which took us right along the coast for a good 12 Km walk. We stayed here three nights with no problems. We had planned to move to a wild camping spot beside the beach at Quarteira where we stayed last year but needed to drain down our waste and fill up with water so we stopped a the camper stop in the very large market area which was conveniently just 100 meters from a good Lidl store (N37.0746, W8.07687) just €2 per night and another €2 for 100 litres of water but no wifi. The electronic panel which keeps track of battery and water seemed to be showing the wrong level of charge of the batteries and needed to be plugged in to the mains for 12 hours or so to reset it although electricity was available here for another €2 we couldn’t get close enough to an outlet with the length of our cable as all the French & German vans which seem to constantly need electricity had all clustered round them. So we decided to miss out the beach and head for Silves which had three camper parks. 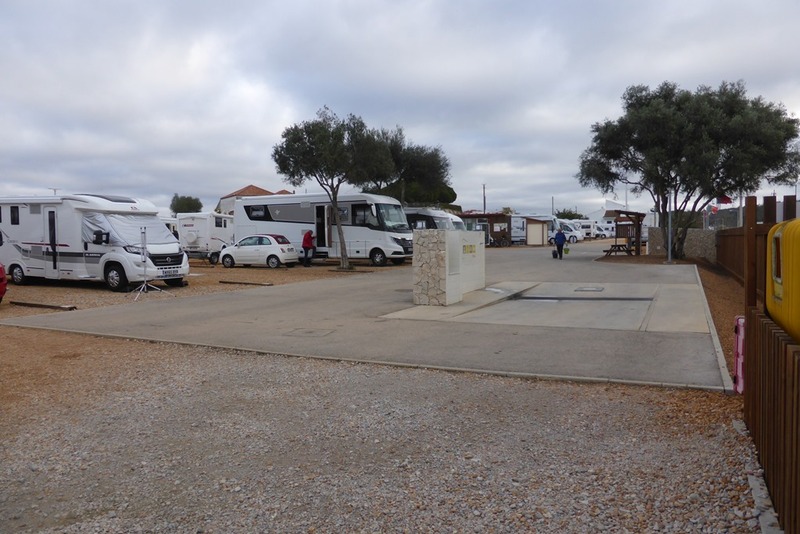 We arrived at Silves about midday and stopped outside the first Camper Park but they all seemed too close for our liking so we took a look at the next one just about 500mtr along the road Called Algarve Motorhome park (N37.18741, W8.45185) which looked very nice with very generous pitches and they had just one pitch left. The cost was €6 for the first night then €5 for subsequent nights and €2 extra for electric so we booked three nights but the first with electric so we could let the panel reset itself. €18 just €1 more than 1night at Benidorm! The site was very nice very clean but the free wifi although fast kept disconnecting for some reason. The Old Town of Silves was basically on a hill with an impressive Castle at the top and very steep cobbled streets. There were lots of small shops and it had a really nice feel about it. There was a Piri Piri chicken restaurant but it was heaving on Saturday when we walked passed so we decided to book for a couple more nights so we could go there for a meal on Monday. We asked the waiter for a menu and he said, “no menu we only have chicken”, so we said ok we will have chicken, “What kind? Piri Piri or not Piri Piri” so we said ok Piri Piri please and that was it apart from saying red wine to drink. We got a starter of a plate of olives a plate of bread with Sardine spread and a small round of goats cheese and a bottle of delicious red wine. Half a delicious spicy chicken with green beans and an enormous plate of chips followed by a dish of fruit and coffee all for €10 each we were very full.